Initially, it may seem difficult to find a way to measure how successful a career fair was or wasn’t. Unlike a sales goal, you cannot determine success based on how much money or business was earned. Instead, a successful career fair is based on how well students and employers enjoyed the experience and how likely they are to refer your career fair to their peers. To find out the answer to these questions, it is best to use the Net Promoter Score (NPS). The NPS measures customer experience and predicts business growth. This metric is calculated using a 0-10 scale to answer the question, “How likely is it that you would recommend ____ to a friend or colleague?” Respondents to the question are then grouped into three categories based on their answer: promoters, passives, and detractors. Promoters are those who answered nine to ten on the scale. These people are true fans and stay loyal to your brand, as well as refer others to bolster growth. Respondents that answered seven to eight are considered passives. These customers are satisfied with the service or product they received, but they’re at risk of deflecting or shifting toward the competition. Anyone that answered a six or lower is categorized as a detractor. These unhappy customers are a hazard for a brand. Negative reviews or word of mouth from detractors can cause brand damage. To determine the Net Promoter Score, subtract the percentage of detractors from the percentage of promoters. This number between one and 100 is your Net Promoter Score. To find out how well students and employers were satisfied by a career fair, the first step is to create a survey. As a career services department, determine the structure and questions of the survey, how many different surveys need to be created, and how they will be distributed. Typically, an NPS survey should be kept short - just three questions. According to Customer Gauge, three questions produce high enough response rates, as well as yield enough data to create actionable insights. Don’t forget to create separate surveys for students and employers if your questions address their status directly. This helps keep confusion at bay and the data sorting process easier. When deciding on the best channels to send the NPS survey, consider your audience. Are students and employers more likely to stay and answer questions at the conclusion of the fair or later on in an email? 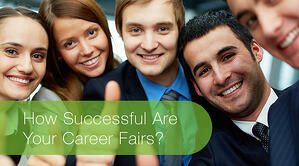 What makes a career fair successful? Customer satisfaction! As a career services office, it’s crucial to determine whether or not students and employers are satisfied with their career fair experience. This knowledge helps make future easier.